ecoi.net, the Austrian Red Cross’ information system on countries of origin of refugees and asylum seekers, is now online in a new version. The new website features a modern design, a new search engine, and more speed. ecoi.net allows you to search through the full text of more than 300,000 documents published by more than 160 regularly covered sources. 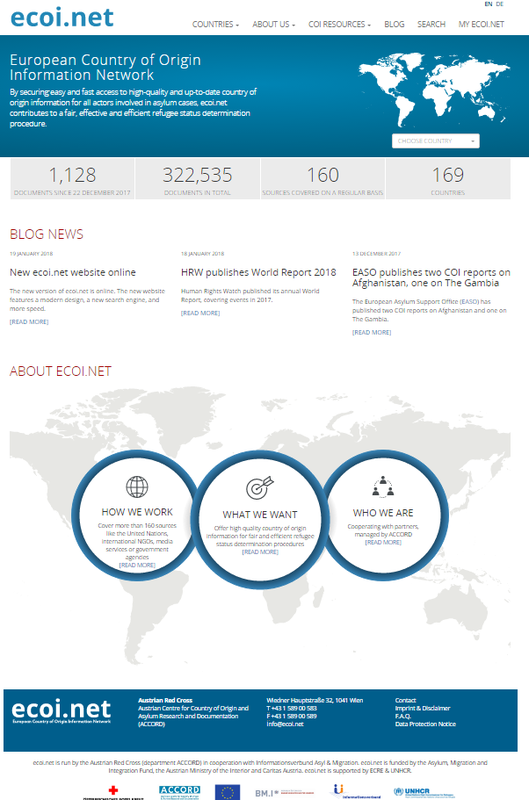 Since 2001, ecoi.net gathers, structures and processes publicly available country of origin information with a focus on the needs of asylum lawyers, refugee counsels and persons deciding on claims for asylum and other forms of international protection. The new search engine immediately displays the number of results for each search filter. You can select more than one property for each filter, and choose how the filter is applied. For instance, you can search through all documents published by multiple sources of your choice. Or you can instead exclude documents from selected sources, or of a specific document type. Existing ecoi.net user accounts will continue to work on the new website. If you do not have an account yet, you can register for free. Registered users benefit from our research baskets and our weekly e-mail alerts informing about selected new publications. You can find out more about the new website under: https://www.ecoi.net/en/blog/ecoi.net-relaunch.